September 24 is the National Cherries Jubilee Day. It is dedicated to a delicious dessert made with cherries and liqueur (most often Kirschwasser), which is flambéed and typically served with vanilla ice cream. The dessert is believed to have been invented by a French chef Auguste Escoffier, who prepared it for Queen's Victoria Diamond Jubilee celebration in 1987. 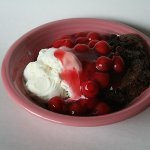 To celebrate the National Cherries Jubilee Day, you can try your hand at cooking this dessert at home. But keep in mind that you need to be very careful because flambéing can be quite a dangerous cooking procedure. Wash and pit 1 pound fresh, ripe sweet cherries. In a large skillet, combine cherries and 1/2 cup sugar. Add 2 wide strips of lemon zest and freshly squeezed juice of half the lemon. Stir until evenly combined. Cover and cook over medium-low heat until sugar dissolves. Uncover and cook over medium-high heat about 5 minutes more. Remove the pan from heat and add 1/3 cup golden rum. Ignite the room with a long match (if you don't have one, hold a regular match with thongs). Swirl the pan lightly until the flames subside. Evenly scoop 1 pint vanilla ice cream into 4 ice cream sundae glasses or bowls, ladle the cherries and their juices over the ice cream and serve.